BECOMING ELITE The Granite Mountain fire crew, led by Eric Marsh (Josh Brolin, foreground), became the first municipal Hotshots crew, the pinnacle of elite wildfire firefighters. Glen Talk about putting viewers through an emotional ringer! 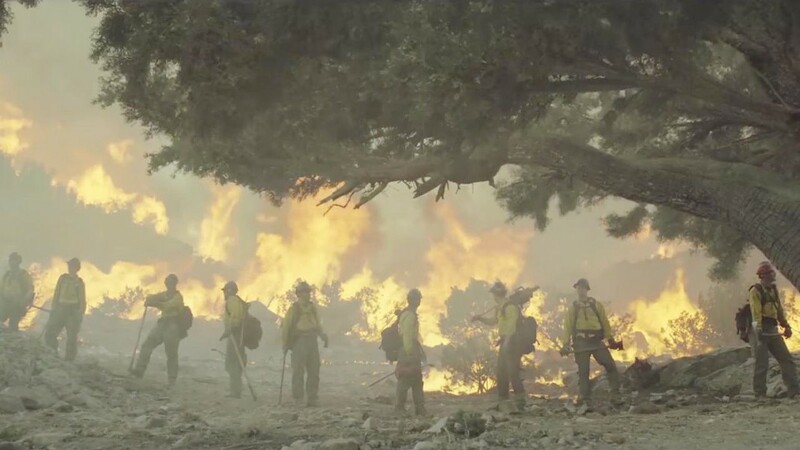 Only the Brave plays more like a war film, where the unbreakable bonds of brotherhood—bonds forged through impossibly difficult and dangerous work—are tested through hardship, the strain of personal lives, and a deep need to succeed. When we first meet the Granite Mountain crew stationed outside Prescott, Arizona, they're working a fire but designated as second tier firefighters. They stay in the back, dig fire lines, and clean up after the "Hotshots," firefighters at the highest certification level who are allowed to engage the fire directly. Hotshots often helicopter into the danger. They're considered the best of the best. 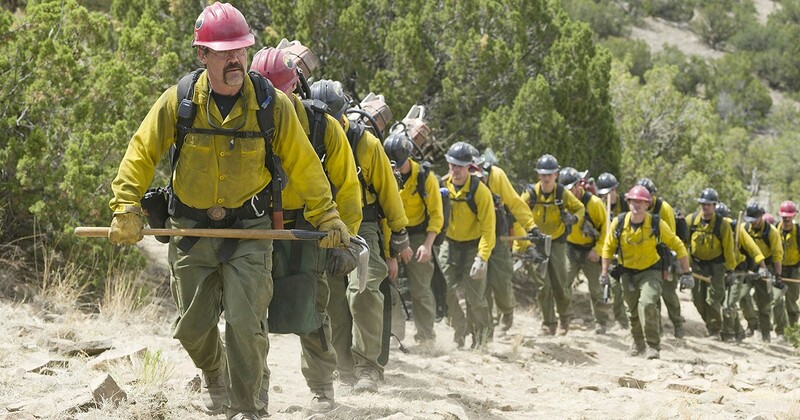 The Granite Mountain crew is headed by Eric Marsh (Josh Brolin), a veteran firefighter who desperately wants his crew to reach Hotshot certification, but they would be the first municipal crew in the nation to receive that elite status, which traditionally goes to state or federal firefighting units. Part of the film's tension is the crew's deep commitment to becoming Hotshots, aided in part by Duane Steinbrink (Jeff Bridges), the fire chief pushing to secure the crew an evaluation. There's also tension between their long and dangerous work hours and their significant others. The film especially delves into the relationship between Marsh and his horse trainer wife, Amanda (Jennifer Connelly), and their deeply held personal secrets are slowly revealed. Add in a new member of the Granite Mountain crew, a druggy burnout named Brendan McDonough (Miles Teller), who recently discovered he fathered a little girl and is looking for redemption, and it's easy to see why the film is so rife with emotionally explosive moments. Some of the guys on the crew, especially Christopher MacKenzie (Taylor Kitsch), are afraid McDonough will endanger the group. After this setup, the film moves first to their evaluation and then to dramatic peak as they join the fight against the Yarnell Hill Fire. Anna Emotionally potent and heartbreakingly based on an actual crew's story, this movie left me drained in a satisfying, albeit exhausting, way. The pride in their work is seen on the men's faces as they come out time and time again, filthy and bloodied, having done everything they can to keep their community from burning to the ground. Tying in compelling and relatable personal struggles, the men are not presented as infallible heroes, instead as husbands, fathers, and friends. The balance between home and work life isn't easy, and tensions run high, especially when the men have to drop everything to once again put their lives on the line. Connelly's performance is especially compelling, and Brolin's earnest portrayal of Marsh is equally good. While ultimately it's a gut-wrenching, heartbreaking story, getting to know this group of men is worth the emotional roller coaster. If this story doesn't leave you a tearstained mess, I'm not sure anything could. STAND YOUR GROUND The Granite Mountain Hotshots battled the famed Yarnell Hill Fire in 2013. Glen I agree that Connelly is amazing, and that Brolin matches her step for step. Both their characters are survivors who have turned their lives around, and while they both were committed to being childless, as Amanda has gotten older, she wants to revisit that, but Eric is still uncertain. It makes for some incendiary moments, and it doesn't help that Eric's emotions are often on edge. In fact, the acting all around is terrific, with Teller—who I don't always like—offering a raw performance as the drug addict who's finally got something to live for. From what I know of wildfire crews, this film offers a realistic look at the training, the camaraderie, and the firefighting techniques used, and my hat's off to director Kosinski for amassing a technical team to create some really believable wildfire special effects. There are some amazing moments, such as a helicopter shot of a running elk streaking away from the fire. Considering what's happened in Northern California, this film is hitting close to home. It takes a certain kind of person to commit their lives to such dangerous work. Whether law enforcement, military, or fire protection, these people are heroes. As Anna mentioned, they're imperfect, but as this film shows, you don't have to be perfect to be a hero.